I've been fortunate enough to spend some time in the studio lately. 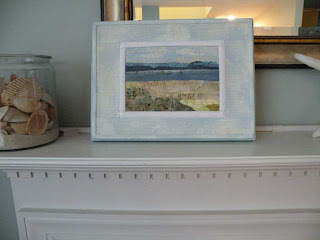 This little landscape started with a small handful of fabric scraps given to each of us in my art group. The challenge was to create something using all the fabrics. We were allowed to add 1 or 2 fabrics. I had some of the blue which I used for the border, so that was one and then I added the dark blue water strip. It was tons of fun to create this. 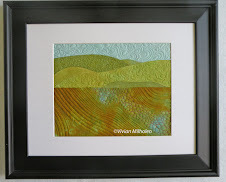 There was even a bit of blue lace which I added to the top of the mountains. A bit of green silk is in the foreground. This is just a quick snapshot of it while I propped it up on my fireplace mantle. I like it on the mantle, so it will probably stay there. Now, I'm thinking this would be such a fun idea to make sandwich baggie size bits of scraps to save for trips or those times when the creative muse is still sleeping. I quilted the tops and bottom of the blue fabric with curving lines to emulate a feeling of a breeze. This piece is mounted on painted stretched canvas. I so appreciate your comments! Beautiful! Can't believe you made this from a bag of scraps... did you sign up for the grab bag challenge? I've thought about it, but every time I gather a fabric collection - I think what I'd want to do with it and then I don't want to let it go! At least the process of gathering has me started on another project. Yours is great inspiration. 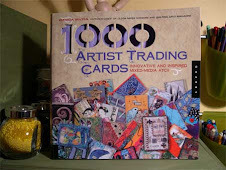 This is such a darling little project...I don't usually like working that small, but it came out great for you. Makes me think about keeping some of those smaller scraps and trying some small things! Thanks for a little bit of inspiration. Besides having a great result, I love the idea of being able to travel and still create. Wonderful piece and, yes, it looks perfect on your mantle. I save most of my scraps...you have given me some ideas on how to use them. Thank you for taking time to share how you make your art. Love it! I like this small landscape. 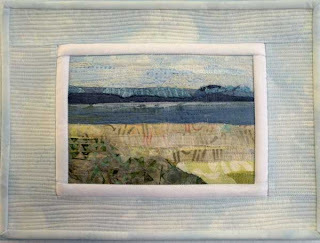 I like the wide borders and the way you have quilted them. Very nice. thanks for sharing your process, it's nice to see how others go about doing things. love your work. Beautiful! I wish Virginia looked like that at the moment! Lovely! I like the way you've "framed" it. This is lovely. What color did you paint the canvas?